On April 4, 2013 we, Maggie and I, coated four dozen of our hen’s fresh eggs in lard and stored them in a crock of oats. 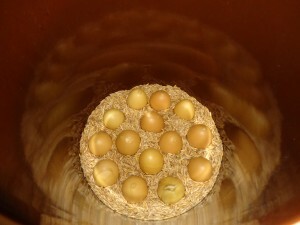 On May 16, 2013 we coated 3 dozen eggs in beeswax and stored them in another crock of oats. I wrote this blog post when we stored the eggs. This was done to preserve them from spring to winter. Fresh eggs are plentiful in the spring and on shortage in the winter. Well it is winter time, so we opened up the egg crocks to see what we had! We had mixed results. Some of the eggs coated in bees wax had spoiled and I was afraid they tainted the whole crock. But the eggs coated in lard were good. I was a little disappointed, but not dismayed. After some reflection on the results I think I understand why the waxed eggs went bad. I often took guests down cellar to show them the salt cured meats, the stored eggs and other intriguing food surprises that are to be found in our cellar. I would open up the waxed egg crock, dig through the oats and pull out an egg to show. I even did some experimental techniques with the wax application; that involved wrapping the egg in tissue paper before dipping it in the wax. But I never opened the larded egg crock. I think my digging around in the waxed crock disturbed the eggs and exposed them to more temperature variation. And I think I found that my experimental waxing methods did not work. The larded eggs were just dipped in melted lard and cooled, no tissue paper. As a test we fried one of the larded eggs. It did not taste very good, but I did not expect it too. Eggs are stored for baking purposes and not fresh eating. But we wanted to try it and we can report no ill effects. Next we tried baking a cake. 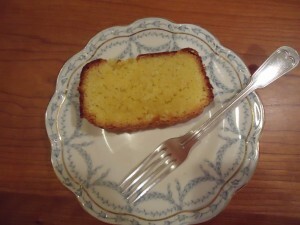 Maggie picked out a new recipe for Cocoanut Loaf Cake (365 Cakes and Cookies, published in 1904), which is like a pound cake with only eggs to leaven it, no baking powder or the like. We were very excited while it was baking and the results were amazing!!! The cake was delicious and the eggs had done just what they should do in the cake, raise it a bit, make it rich and lend a beautiful yellow color. The cake was baked yesterday (Nov 21, 2013) and we both ate some and can report we are in good health. Cocoanut loaf cake made with eggs preserved with lard. Eggs put in storage on 4/4/13 and cake was baked on 11/21/13. Eggs more than 7 months in storage! Now we have eggs to use for holiday baking!!! Good thing too because my chickens have not laid an egg since November 4! Next year we will do the experiment again, another crock of larded eggs and another crock of waxed eggs. I will stick to the plain method of coating the eggs with the wax. I think both methods, waxed and larded, hold a lot of promise. Most important I will keep my hands out of the egg crocks during the storage period! Perhaps I should make a demo crock with fake eggs that I can share with guests! Now of course this is not USDA approved so I can’t tell you to try it at home. But It does seem to hold some promise for me and Hillside Homestead! So bring on the holidays; I’ve got eggs! This entry was posted on Friday, November 22nd, 2013 at 6:50 pm and is filed under Chickens, Hillside Homestead News. You can follow any responses to this entry through the RSS 2.0 feed. Both comments and pings are currently closed. 12 Responses to “Preserving Eggs with lard and beeswax – success, failure and promise” Comments are currently closed. Other stuff can be used instead of oats. Saw dust, dry sand, wheat chaff, The oats are just a ‘medium’ for holding the eggs. I just use oats I bought at the feed store! thanks for the kind words! and Happy Thanksgiving to you too! Straw would work too, or wheat chaff or really dry sand. The oats or straw are just a ‘medium’ for holding the eggs, so they don’t touch each other during storage. The wax or lard is just to coat the eggs and close them up and seal them up. I really think the wax will work well, I think it was the way I handled it BAck when I worked at Firestone Farm at The Henry Ford, we did the beeswax thing and it worked. I think Parafin would work too. Parafin becomes more availalbe duirng the 1920’s, it is a by product of processing gasoline. I like the idea of two crocks of waxed eggs – one to keep shut and one for show and tell! I have been wondering about storing eggs! I have heard that submerging them under water is also a possibility. How do you “tell” if an egg is bad… since they don’t taste very good after storage? They smell bad or maybe just ‘off’. The stored eggs are not good for eating as fried eggs or scrambled eggs or boiled eggs, etc. but they are good for baking cakes and pancakes and such. thanks for asking! Were the Oats rolled or whole? How did you test them for spoilage? did you just float them? IF so, did you rinse off the lard or wax first with warm water? I bought recently a few sheets of Bees Wrap (google it)and am wondering if , like the Bees Wrap, a bit of Jojoba oil mixed in with the beeswax would improve the protection, since it has antifungal properties, or mixed with Tea Tree oil (mellaleuca oil) which will kill MRSA in tests. I like the smell of the Jojoba oil better, and it is edible, but its said the tea tree oil is not edible, although that may not matter when coating eggs with it. My Grandma said she used to use Paraffin. I expect however, that today’s paraffin is a petroleum product, while old paraffin was edible and often used in candies and in canning jams. I suppose I would in the end wish to keep the eggshells safe to ingest, since I dry and pound mine into a find crush and feed them back tot he hens. Grandma used to do that, too and said it helped the hens’ eggshells be stronger. It worked for me when my biddies were breaking eggs. I don’t want to feed the biddies anything i cant eat in meat or an egg. Thanks for sharing your great experiences! OOPS. Forgot a thought… Wondering how coconut oil would coat them, since it firms at room temp when cooled. Might get a better thickness on the egg. If that is important. Coconut-sulfer smell seems a bit confusing. I noticed that my eggs I bought last October (I keep my homegrown eggs for about a year, but store bought aren’t keeping as well. even tho they say organic…) are giving a bit of sulfur smell, although still not spoiled, as I used two in a cake last night. The homegrown ones I keep from my biddies, until I run out, haven’t done that, and I only carton them and refrigerate them. I keep the fridge just barely warmer than I can keep the eggs from freezing. IF I had a cellar I would try to coconut oil… No cellar. Sorry for the long delay in replying! OK will answer your questions to the best of my ability. One overall note I can say is that you are making it more complicated than it needs to be. The idea is to coat the egg with some type of air suffocating cover (I’ve used wax or lard) and then store them in some type of ‘medium’ just so that the eggs are resting easy in the crock. The best advice I can offer is just try it and see how it goes. Makes observations as it works or doesn’t and make plans for the next time. 1.I use whole oats. I bought them at my local feed mill. 2.I tested them for spoilage as I used them. When I wanted some eggs I went down to the cellar and took some out of the crock. Took them back up to the kitchen. Cracked them one at a time into a separate bowl. So far only 3 of 39 have spoiled. You will know when they are bad because they smell bad. The yolk easily breaks and it would be very difficult to separate the white from the yolk in a stored egg. They are not as nice as fresh. I did not float them. And I just wiped off the lard with a rag. I through the shells and remaining oats out in the compost pile where the chickens like to scratch. 3.The bees wrap stuff looks pretty great. But I don’t think you need to buy anything special for storing eggs. Wax or lard will do. 4. Essential oils would be wasted here I think. The wax or lard is preventing air from penetrating the shell. The oats just hold it all together well. Keep it simple. 5.Paraffin has always been made with petroleum processing by products. It did not become popular till the 1920’s for putting up jam and jelly. Before that time people used brandy and egg papers. That is a whole other blog post. I can’t believe I haven’t written that one. 6.You asked about coconut oil. That might work. I will never try that because I would have to buy the coconut oil. I render lots of lard from the pigs I raise. And I can buy beeswax from a neighbor. Some of the old timers also used slackened lime and just dropped the eggs into that viscous, slimy, quicksand like goop. I never tried that, the beeswax method is so neat and tidy and that appeals to me. 7.So it sounds like you are storing some eggs. I would never try to store eggs I bought at the store, only ones raised on my farm. Eggs sold at the store have been washed and the bloom was washed right off. That natural coating helps keep the eggs longer. I don’t think organic has much to do with how long an egg would keep or not. It probably does have to do with the nutritional content. Farm eggs just taste better! 8.I think if the eggs smell bad in storage – they are bad. Anything that smells bad in storage I carry outside and carefully crack them open at a distance from anything important, just in case they are truly rotten. 9.NO cellar huh – that is sad. Maybe you could creating a small root cellar buy burring an old chest freezer. I’ve seen folks do things like that. But no cellar is sort of sad, sorry. Cellars and root cellars are usually somewhat constant in temperature over the year. I do notice some changes in humidity. I think a fridge can be a rather dry place. Anyway – good luck! I hope I helped. Another thing to do to keep eggs all year is to look at your hens and really think about them and study them. Maybe there are some management techniques you can incorporate that help keep a steady supply of fresh eggs all year. Ducks can be good all year layers. What a neat blog and what cool information you are passing on—thank you!